Advanced HMI is a powerful, adaptable HMI/SCADA (Supervisory Control and Data Acquisition) development package that takes advantage of Visual Studio. There is no coding required and you can simply drag and drop items onto the page. The best thing is that the software is free. 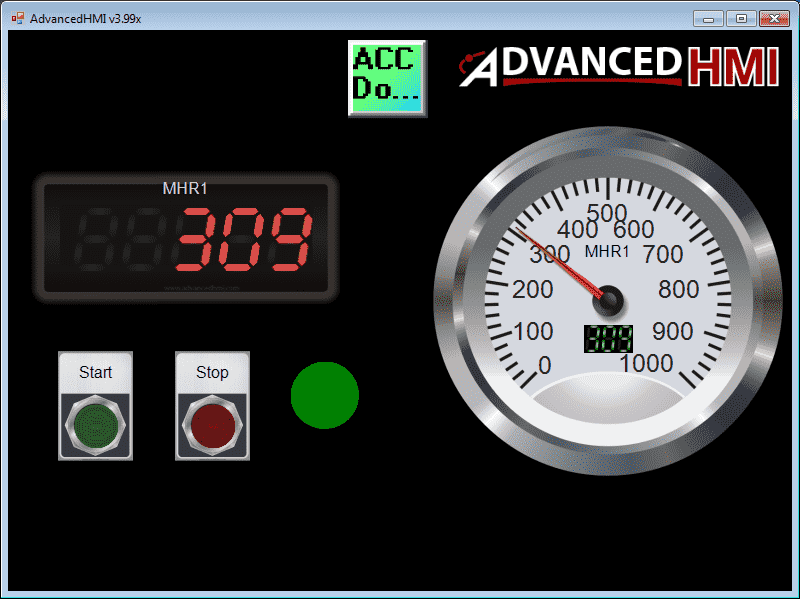 We will look at using AdvancedHMI with the Productivity 1000 Series PLC. Our sample Productivity 1000 PLC program will display a digital panel meter and a gauge of a value in the PLC. Stop and start momentary pushbuttons on the HMI will allow this number to increase or stop. An indication will turn green when the number is increasing and red when it has stopped. 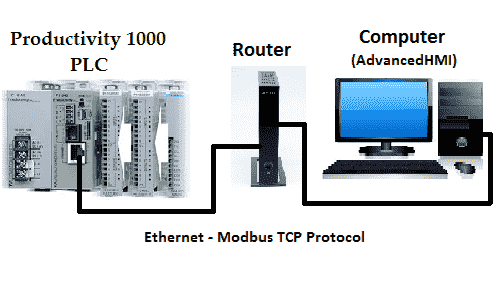 The AdvancedHMI package will communicate Modbus TCP over Ethernet to the Productivity 1000 PLC. We will be able to monitor our process via the AdvancedHMI window. Let’s get started. Firmware is usually PLC operating system code that is written into a read only memory. The BIOS (Basic Input Output System) of a PC (personal computer) is a good example of firmware. It provides the low level interface between the hardware and software. 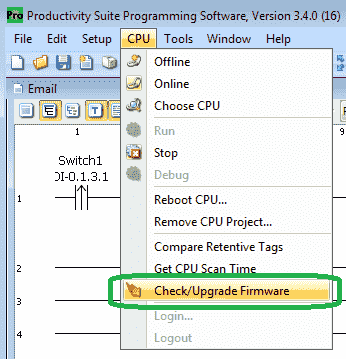 The firmware for the productivity series of PLC’s must be downloaded separately from the programming software. 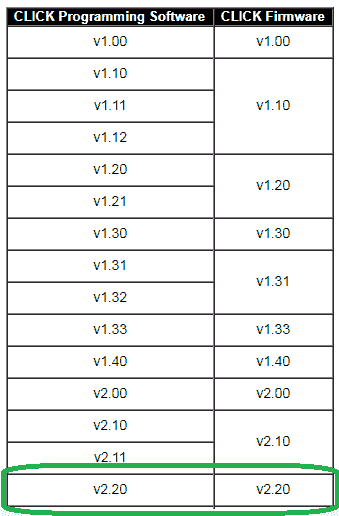 We will be updating our firmware of our Productivity 1000 PLC from 1.2.5.36 to the latest version 1.2.7.37. Let’s get started. Continue Reading! We will be looking at the last three different high speed counter modes available in the click. 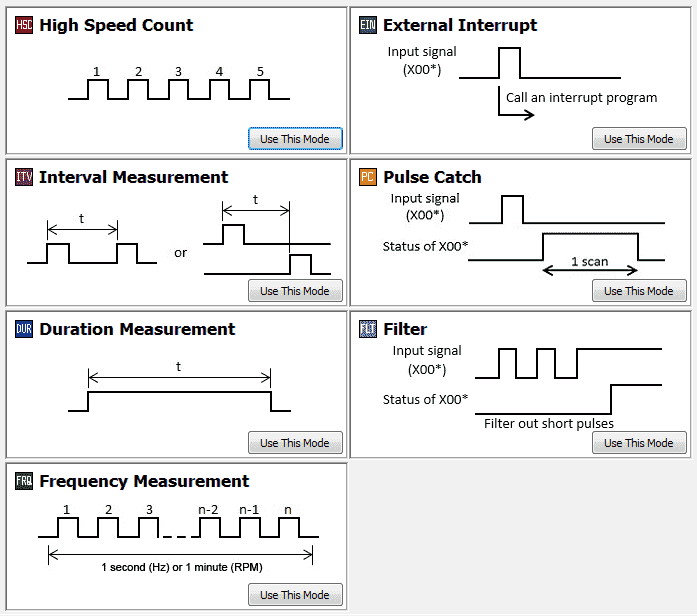 (External Interrupt, Pulse Catch, Filter) This is all setup through a user friendly graphical user interface. We will also combine the Frequency Measurement and the High Speed Count in one application. Let’s get started! Keep on Reading! Rotary encoders are modern digital devices that have taken over from the potentiometer in stereos and many other applications. This is because of their fine digital control and they can fully rotate without end stops. We can connect the rotary encoder into the PLC using just two digital inputs. This human machine interface (HMI) has the advantage over touch screens and other methods of control into the PLC. The operator can control the rate and set point with the dial (rotary encoder) without looking at the control. This will allow the operator to concentration on other tasks. We will be connecting a rotary encoder with dial into the Click PLC. The signals being sent from the rotary encoder will be explained. Different methods of programming this input in our PLC will be discussed. Let’s get started. Keep on Reading! The Trumeter ADM100 Series Graphical Panel Meters provide the visual representation of an analog meter and the accuracy of a digital meter all in one unit. These meters feature a programmable bar graph and alarms to immediately alert operators when a parameter is out of range. In addition, a four-character messaging area displays custom messages, alarms and annunciators. 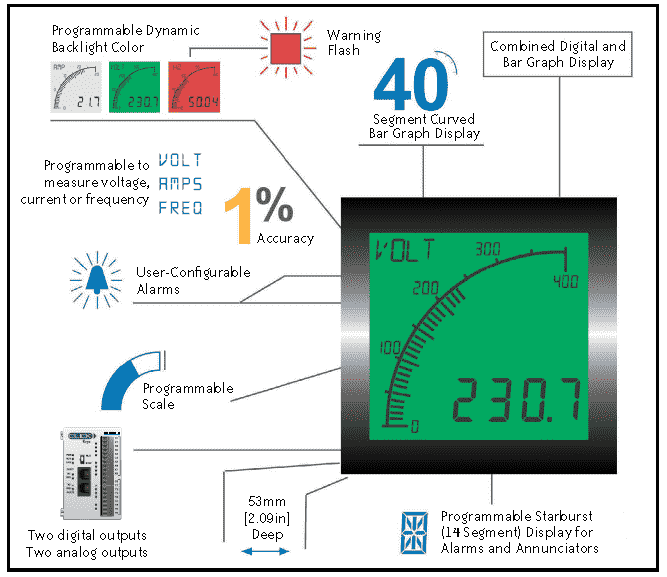 Every meter is configurable to measure voltage, current or frequency. The M100-Lx model is for use with a low voltage power supply, and the ADM100-Hx is for use with mains power. Both models offer two LCD options – positive LCD for bright conditions or negative LCD for dark environments. We will be looking at unboxing the unit, powering it up, installing the software and setting and communication to the Trumeter AMD100 Series Graphical Panel Meter. Let’s get started. Continue Reading! We would like to take a few minutes and reflect on the past, current and future of ACC Automation. Your questions, comments and suggestions have helped us to build the site that you see today. Thank you. 2018 has been our best year yet thanks to you. Keep on Reading! Firmware is usually PLC operating system code that is written into a read only memory. The BIOS (Basic Input Output System) of a PC (personal computer) is a good example of firmware. It provides the low level interface between the hardware and software. The Click PLC firmware comes with the programming software. We will be updating our firmware of our Click PLC from 2.10 to 2.30. Let’s get started! Keep on Reading! The productivity series of PLCs comes with 4 built-in communication ports for easy connectivity to your PC or various industrial networks. 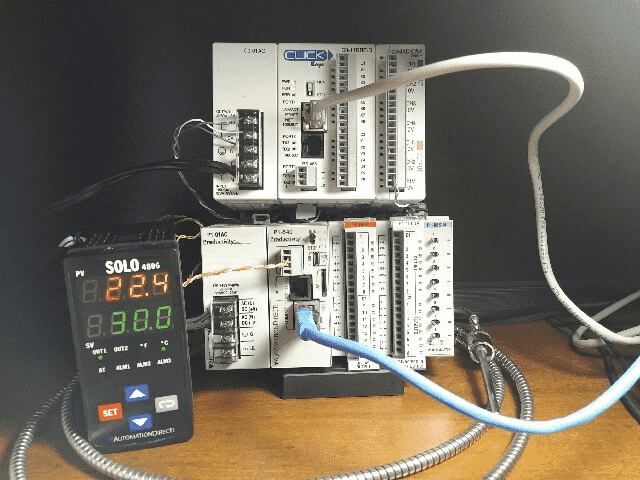 Ethernet protocols like Modbus TCP can be utilized with the RJ45 port on this PLC. Modbus TCP is an open (published) protocol that uses the Server (Master) / Client (Slave) architecture. It’s a very common protocol used in industrial automation controls. We will be using the RJ45 (Ethernet) port to communicate to a Click PLC. Modbus TCP will be the protocol used on this Ethernet communication media. The Productivity 1000 PLC will be the server and the Click PLC will be the client. We will be creating a network between the two PLC units. A heartbeat will be used so if communications is lost, the server (slave) will know. 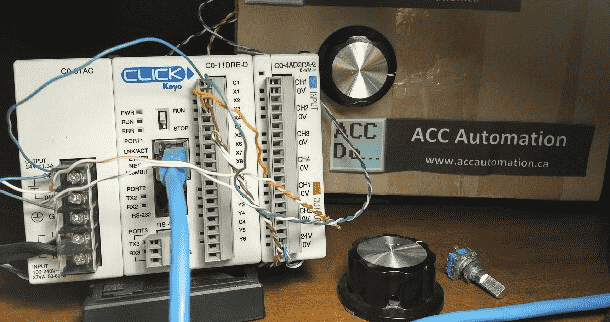 The throughput time will be timed by using a small program in the Click PLC. You will soon see how the Productivity Series of PLC’s is the best way to handle communication to other devices. Let’s get started. Continue Reading!